Over on megagame-makers.org.uk, there is a description of megagames, a style of wargaming with many players organized into teams with a hierarchical structure. Now, I'm a bit skeptical about the claims there of inventing the style. That style is something I saw all through the 1970s in game clubs and records of similar ways of running games obviously existed in Lake Geneva and Minneapolis with the wargaming groups in the 1960s. Nevertheless, it's an interesting look at what was happening in the UK during the period it covers. Read more here. Of course, it also brings to mind the way in which RPGing was brought about through wargaming, but taking on the role of the leader of your forces while imagine how to strategically play out the scenario. 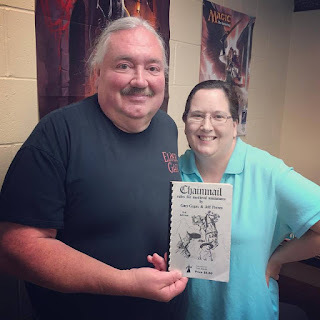 Much has been writeen in recent years about David Wesely, a lifelong wargmer who Dave Arneson credited "with the idea of the role-playing game." The game he ran in 1967, now nominally known as Braunstein, the style of play was certainly pivotal in the invention of RPGing as well as sounding a great deal like the megagame.